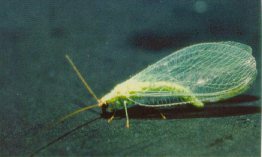 Green lacewing (scientifically known as Chrysoperla rufilabris) is widely used in various situations to control many different pests. Many species of adult lacewings do not kill pest insects, they actually subsist on foods such as nectar, pollen and honeydew. It’s their predacious offspring that get the job done. If you’re looking for effective aphid control, green lacewing larva should help do the trick. The adult lacewing lays her eggs on foliage where each egg is attached to the top of a hair-like filament. After a few days the eggs hatch and a tiny predatory larva emerges ready to eat some aphid pests. Each adult female may deposit more than 200 eggs. For best results, habitats should encourage the adults to remain and reproduce in the release area. Nectar, pollen, and honeydew stimulate their reproductive process. Green lacewing adults can survive the winter in protected places but have a difficult time surviving cold winters. 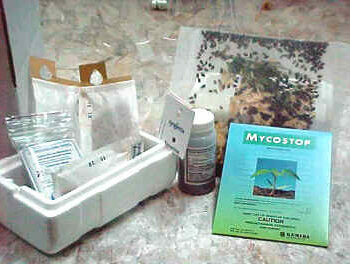 Adults: Green Lacewing adults are sold in containers of 100 and should be released the day received. If immediate release is not possible, moisten the accompanying sponge in water and replace it. We do not advise refrigerating the adults. One adult female lacewing can deposit up to 800 eggs in its four- to six-week lifespan. Proper habitat and food will encourage adults to stay in the area, continuing the Better Pest Management lifecycle. To release, remove the top screen and use a piece of cardboard to regulate the amounts released throughout the target area. To prevent a high percentage of the Lacewing population from being in the pupal, adult or egg stage at the same time, it is recommended that two or three releases, two weeks apart, be made. Lacewing larvae are good general predators and will also feed on whitefly larvae and other plant pests. Release instructions are included with your order.